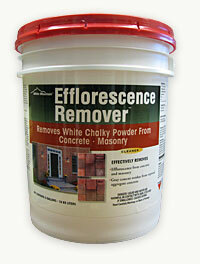 Efflorescence is the white, chalky residue that forms on the surface of concrete brick pavers. Efflorescence is completely natural and occurs with all concrete products containing cement. Efflorescence is created when the calcium oxide naturally found in the cement mixes with water to form calcium hydroxide and then is leached to the surface of the paver where it comes in contact with the carbon dioxide in the air and then forms calcium carbonate which forms the white, chalky residue referred to as efflorescence. The formation of efflorescence is NOT a sign of defective or damaged concrete brick pavers. Efflorescence will naturally disappear on its own once all of the calcium oxide in the cement is leached out, but the time that this takes varies upon your local climate conditions. 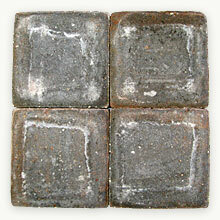 The more rain that your concrete brick pavers receive, the faster the efflorescence will leach out. How Do I Remove Efflorescence? White Mountain Efflorescence Remover is specially formulated for removing efflorescence from concrete brick pavers and can be applied using a low pressure sprayer, brush, or watering can. Extreme cases of efflorescence may require a repeat treatment. After using efflorescence remover, nuetralize with White Mountain Jobsite Cleaner and allow 24 hours of drying time before applying sealer.